Whether we recognize it or not, New York City is facing something of a transportation crisis. The problem itself won’t come to a true head for a while, but outside of a few avenues, our current transit options are nearly maxed out. Our roads are continually congested, and without significant expansion, the subway system can’t withstand too many more trains — or passengers — per hour during peak times. Buses and a real bus rapid transit network could pick up some slack, but lately the focus has turned to the city’s myriad waterways. For much of the 2013 mayoral campaign, we heard candidates from various parties talk endlessly about the opportunities for expanded ferry service. It sounds good, right? These are politicians actually promoting increased transit, and at a time when subway construction is exceedingly expensive and no one at the MTA is willing to try to rein in those costs, sticking some boats on the water seems downright economically responsible. It is but a political smoke screen as well, and I’ll get to that shortly. The expansion of ferry service to the East River in 2011, connecting Wall Street and East 34th Street with Brooklyn and Long Island City, has also proved successful, as has a route to the Rockaways that was originally meant to be temporary. Now ferry advocates — and elected officials — are looking to expand service to other parts of Queens with waterfront connections. …Already expansion beyond Long Island City and Rockaway may be imminent. According to one source, expansion of the East River ferry to Astoria is “more than likely,” and former Councilman Peter Vallone Jr. allocated money toward a feasibility study. 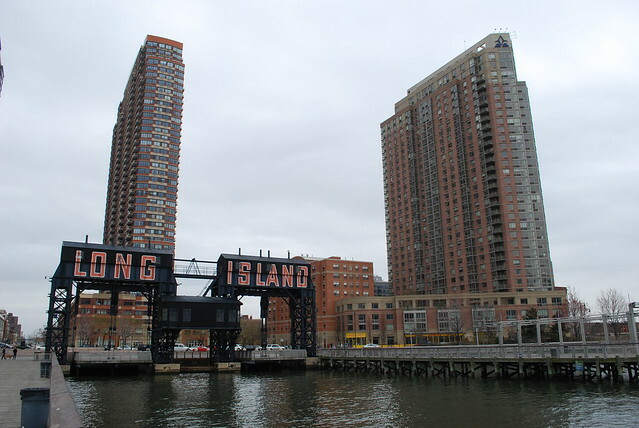 Vallone’s successor, Councilman Costa Constantinides (D-Astoria), said bringing ferry service farther north to Astoria would be a boon for the Western Queens waterfront, especially if they add a stop on Roosevelt Island, where a tech school is slated to be located. “We can find the money for this worthwhile cause,” said Constantinides, a member of the Council’s Transportation Committee. He pointed to Hallets Cove as a location for a ferry, noting the amount of development taking place there and the need for more public transportation. I have such major issues with this defeatist attitude toward subway construction. We’re giving up because politicians aren’t strong enough to fight back against rampant cost issues or, in the case of Constantinides’ own district, intense NIMBY opposition to a plan that would have brought the subway to Laguardia Airport. We can’t throw in the towel on future subway construction and expect New York to be able to grow. Ferries won’t cut it. Meanwhile, the comments and coverage concerning ferries fail to make note of the issues of scale. The Rockaway ferry may be a success, but that’s with ridership of 700 per day. One peak-hour subway carries at least twice, and sometimes three times, that amount from Queens or Brooklyn into Manhattan. Ferries can help out around the edges; they can’t affect transformative change or do much to alleviate the transit capacity problems plaguing New York. The single biggest issue with any New York City ferry network concerns population patterns. New York of the 20th century built inland and, thanks to Robert Moses, rung its waterways with roads. Not too many people live near potential ferry terminals, and not too many work near them either. So a ferry network also involves getting people to and from the terminals, and with fares not unified, such a setup currently involves a steep added cost per day. Most New Yorkers would rather take a crowded train than add $3-$5 per day to their commuting costs. Furthermore, nearly every place in New York City that is well suited for ferry service already has it. The East River ferries offer relatively quick commutes to areas where people work. Many of the folks who live in uber-expensive waterfront condos in DUMBO, Williamsburg and Long Island City work near Wall Street. Travel patterns shift as one moves further east in Brooklyn and Queens. But there are political forces at work here that account for the popularity of the boat movement. First, there are no NIMBYs to battle. Some people may object to a nearby ferry terminal and the noise from the boats, but it doesn’t engender the same level of protest that a new subway line or removing a lane of automobile traffic for bus rapid transit would. Second, the costs of starting a ferry line are relatively low and turnaround time is short. Thus, a politician can propose a ferry route, secure funding and attend a ribbon-cutting in a single term while proclaiming to be pro transit. Never mind the fact that, at most, a wildly successful ferry with 4000 daily riders services half of one-tenth of a percent of all New Yorkers. It’s an easy political win. So we’re stuck in a boat rut. It may make limited sense to examine some ferry routes, but the most they can do is shuffle the deck chairs on the Titanic that is the subway system. Without high-capacity expansion, trains will be more crowded than ever before, and New York City will face growth constraints. It would take real leadership to tackle this problem; the ferries are simply a smokescreen. I hope that doesn’t mean 2100 sardines in one train. The sardines, however, smell better. Do you have a list of the most congested subway lines? I’d love to see how they could even potentially be relieved by ferry service. I suspect the congested lines aren’t even close to water to make ferries a viable alternative. Just thinking from memory, the 456 is probably the most cogested, that might have been a viable ferry addition, but we’re getting SAS instead to relieve a lot more congestion. The 123 is not near water except ~125-155. The L is only near water in Williamsburg and there is already ferry service there. The 7 only approaches water at Willets point, but given the time and cost of that ferry, the LIRR stop in place is a better alternative. The Queens Blvd lines are no where near water. Maybe you could attract some riders by Coney Island, but they get a seat out there, and you’re not going to convince them to pay more for a longer ride so that there will be more space on the subway for riders getting on in Park Slope. So how exactly are ferries supposed to help anyone? It might make more sense to compare a ferry’s ridership to a subway station, not a subway line. If a ferry landing could attract a few thousand riders a day who are within walking or biking distance, even if they need a subway on the other end, then it would be closer to adding a subway stop, or maybe more like an express bus stop, but not an entire subway line. There are limited areas where that would make sense. If the Hallets cove development goes through, it would be almost a one mile walk to the subway. It’s conceivable that there would be some who could find a ferry more convenient, including some current residents and subway riders. Ridership at 30 Av and Astoria are 13k and 10k per day. Maybe a ferry could siphon off a couple hundred from each, but probably not much more. There are a handful of locations in Queens and the Bronx where that could work out too, especially with the continued development of the waterfront. The lions share of transit expansion however needs to happen inland, just for existing residents, never mind new ones. If he’s really that concerned about the all the people by the water – and not just the new people coming in at Hallet’s Cove – then he could push for BRT or at least a good old SBS on 21st St, which is a much shorter distance from the water than the N/Q and leads directly to an F train stop. Leading to the F is a bad idea. By the time the train reaches 21st Street, you’ll be lucky if you can even get on. There’s already too many trains running at once to make room for more on Queens Boulevard and trains originating or terminating at 21st Street would be impractical. The other problem with this is that the real problem is merely shifted around rather than tackled. Now, if there was some way to have another route there, it might work. Helping people is probably besides the point. The point is to twofold: (1) gain political support from unions/contractors and (2) make it look like politicians doing something useful in the process. You could probably use more ferries to relieve the pressure on PATH, NJT, the Holland and Lincoln Tunnels, and the GW Bridge. There’s a *lot* fewer crossings of the Hudson River than there are of the East River. But there aren’t any ferry docks between W 39th St. and the World Financial Center. There’s also nothing north of W. 39th St, and it’s probably impossible to build anything north of 79th St, unfortunately. Because the subways don’t run to the shoreline, there’s a lack of connectivity from the ferry docks to anything else. As noted before, the Robert Moses expressways / giant boulevards next to the shoreline of Manhattan hurt even more. Perhaps this is why the downtown ferry terminals are more effective and busy than the others; they aren’t cut off from the city. Maybe if a decent walking connection can be provided from the 39th St. ferry terminal to the #7 extension “Javits” station, that particular set of ferries would get increased usage. It might make sense to have a Hoboken Terminal – 39th St. ferry again. As for other new ferry services, the most plausible additions seem to *me* to be from Weehawken or Hoboken, New Jersey to a new point somewhere between W. 39th and the World Financial Center — pier 54 or something. Even that’s not super-plausible, but it’s more plausible than anything wholly inside New York. Queens? The most useful ferry route is Hunter’s Point to 34th St, and it already exists. I suppose you could make a case for Hunts Point, Bronx to Queens, avoiding roundabout roads. Proposing ferries is an easy way for politicians who don’t care (because they drive everywhere) to pretend they care. As far as they’re concerned, they’re giving the unwashed masses something to chew on and that should be enough for the next election. Here’s a thought: adding meaningful transportation capacity is expensive and time consuming. What if, instead of spending money to expand transportation capacity, we instead paid employers incentives to have their employees telecommute? Or to find other ways to have them not commuting through choke points during peak times? We’ve been doing this to address electric grid capacity for years, it’s why on a really hot summer day you might see half the lights in your office turned off. The same concept should in theory work for transportation, and it might be more cost effective at reducing congestion than adding capacity is. 2. If you can telecommute, then your job can be outsourced to India. Not worth it. That’s probably mostly only a benefit for affluent people though, and even they have to work around things that work around office hours (like school). On the flip side, I guess a non-trivial proportion of the less well have been working longer hours. Staggered starts is what used to happen. Back in the day, NYC factories employed millions of people who started work at 6-8 AM. Right. The 24hr subway is probably mainly because of the wide existence of 3-shift industrial operations. Many of the people with staggered hours nowadays are the ones who can afford to drive. They can leave before or after rush hour. most industrial jobs still start early and end early. though obviously there are not as many industrial jobs. Another thing is those jobs probably also defied the idea of flexible staggering too. As to working longer hours. Everyone works long hours. The ppl I know that make the most money actually work the most. They don’t have 40 hour weeks. There’s a reason why the public cheered the arrival of the additional East River subway tunnels, along with the Queens Midtown Tunnel and Triborough Bridge between the late 1920s and 1940. The access points of the East River ferries were difficult to reach, the winds were cold along the river in the winter and you likely still had one additional fare to pay on one side of the river or the other once you got off. Those conditions haven’t changed all that much in 80 years, and any sudden explosion in ferry plans will have to take that into account once the novelty of the boats wears off (Hudson Yards will be the only new station near the water, and that’s only helpful for New Jersey or possibly Staten Island passengers, if the high-speed boats actually do go into service). Ferries serve affluent people and waterfront luxury developers who want to attract them. I don’t mind up front subsidies to generate economies of scale, but in the long run ferries are luxury transportation, and should cover their costs. Your concern with subway expansion misses the real threat. Subway collapse due to the end of ongoing normal replacement, with all monies going to past debts. The anti-transit lobby is less hostile toward rubber-wheel-on-asphalt buses than it is to rail. Ferries seem to have attracted the attention of developers trying to make their stupidly placed developments accessible. Still, as far as people hostile to public transportation are concerned, all public transportation is a handout to the impoverished. The funny part is their support of buses-or-nothing ends up being more expensive – it’s that important to them to make sure transit is sub-par that they have to spend more to do it than they would have to spend just doing it right. If somebody could show me numbers demonstrating a ferry working as well and being as energy efficient as a modestly used bus line, I would see no harm in supporting such a ferry service. But almost every example I’ve seen has been much, much worse in terms of ridership alone. No one is hostile to rail. As things currently stand, it just costs too damn much. You just perceive anyone who favors bus improvements as a short term solution as anti-rail. That isn’t so. If we never had horse cars take part of the right of way, we would never have had electric trolleys. Perhaps you could say the federal government is in effect anti-rail. In that it’s pretty easy to just buy some buses, but installing rail requires years of studies and EISes. Nonetheless light rail has been installed all over the U.S. The problem is, once again, it costs too much. It also involves taking a right away for the exclusive use of transit, something private motor vehicles fight. The best shot is to get BRT in there first, quick and cheap, and then upgrade down the line. If the price comes down and after the ridership is high enough to justify short headways with multiple units. The feds only offer capital assistance, so of course they prefer buses. They don’t have to pay for the shortcomings later. Transit agencies, OTOH, prefer to overbuild as much as they can because they know they won’t get money later. I don’t believe in short-term solutions period. If rail is too expensive, then buses are too expensive since they cost more per rider. We need to plan for 2050, not 2015 or even 2020. For design reasons, I certainly think buses have a place in the transportation system, but they are useless as substitutes for subways (sub-par but doable for light rail). Broadly speaking, the reverse is true too; if somebody tried to do the reverse, you would see me raise an objection. This is just one reason why I oppose B44 SBS. Another reason actually does have to do with road space; traffic was already bad on Nostrand Avenue due to being heavily used but rarely having anything near the required width capacity. Then there’s the issue of people possibly choosing not to use it due to being further away from where they live if heading northbound. After all, it’s practically a transit desert between Nostrand and Utica Avenues south of Empire Boulevard. I realize it has design flaws with the absurdly long stops, but the B44 itself makes sense to me as a route anyway. Taking away a lane doesn’t necessarily improve traffic, but it’s improbable that it makes it worse. This is where Larry rather mischaracterizes my view on the subject: the problem with the B44, and most BRT planned in New York, is not that is in lieu of a subway instead of complementing one. If anything, we should be SBSifying more of the bus network because it cuts costs and improves trips – but that still doesn’t replace subways/rail. I’m with you – every transit mode has it’s place, but to bustitute as you call it is the worst of all worlds. They seem to do OK when there is no route on which the bus can possibly go, i.e. no bridge or tunnel — or the only bridge or tunnel involves a lot of backtracking and congestion. But you already *have* those ferries. New York Waterway moved in on those markets, most of which are from coastal New Jersey to Manhattan, very early. Speaking of ferries, were there ever any ridership numbers posted for the Bay Ridge ferry? I keep hearing how that’s been the best thing since sliced bread, but every time someone asks for how many people are actually riding them, you can never get a straight answer. This article from December cites 250 on 5 morning boats. Of course, that would be fine if the boats were small enough. My next door neighbor in Bay Ridge who works in lower Manhattan tried the ferry for a while, but, like most, abandoned it after a brief period. The fact is that the R train and connection ( at Atlantic, or Jay Street, or Court Street ) is still much easier than any ferry will ever be, even if it was moved to a less remote location such as the 69th Street Pier. You have to look to the city of 30 years ago to understand the politics of today, because the same crowd is still in charge. The subways for the unwashed, and populated by criminals. Decent people who didn’t drive wanted express buses, like the ones in the white lifeboat neighborhoods around he Southern Rim, so they would not have to take the subway. Even if they were slower, cost more, were massively subsidized, etc. Ferries take the place of the express buses for the same mentality. What would the alternative by for locations distant from the subway? Probably bicycle parking at subway stations. Thanks Ben. I guess you can consider anything a success when you set the bar that low. I’d say that there’s a transit crisis in NYC right now, and many points are stated in this article. 2 weeks later after the last storm/melt off, the roadway of the Kosciusko Bridge is in total shambles, along with many other NYC streets. That highway is very crowded to boot. Subways are SRO and still limited in their reach in many parts of the outer boroughs. Buses get stuck in our gridlocked traffic, and their service is still highly erratic. Adding a few boats to the waters fixes nothing and just costs taxpayers more money. Another example of the no we cant syndrome regarding subway expantion, so we substitute it with less practicle modes of transportation. That’s not to say ferries don’t have a place in the total transportation network, cause they do as does BRT & light rail. However, nothing will subplant rapid forms of rail be it subway or commuter rail. Sorry, I don’t know how to do that. However there’s more than one way to skin a cat. When you quote a block of text, enclose it in the blockquote HTML tags like this. I get what you are saying, but I cant see it well enough. Instead I’ll mark it in some other way. That’s still HTML, but it’s a lot shorter. The cost is the biggest issue for me. If the ferry system and subways were unified, and I could access the ferry with my MetroCard, I’d use it every day. For now it’s only an every now and then thing… or a “the MTA decided to shut my subway access to Manhattan for 26 weekends” thing. Ridership by station (that’s the weekday figures). Broad Channel A/S has all of 267 people using it in 2012. Does that correspond to a ferry service that services a similar number? Possibly. Ferries are easier to implement because other than the berthing/ferry slip, there’s no infrastructure that needs to be acquisitioned/maintained. It is a no-brainer to propose for a politician as Ben notes, but the potential upside is so much lower. Could the money spent on a ferry be put to better use via SBS or true BRT? From what I’ve seen/read, I’d lean to yes. But considering the NIMBY opposition to pretty much even minor changes to the streetscape, let alone major work to implement a light rail or BRT or subway/heavy rail, this is the best we get (or deserve). The real missing link is ferry to LaGuardia. Ferry appropriately matches the demand for airport service without a billion dollar boondoggle elevated. They tried that and abandoned it. Sure, if you’re trying to serve the population of Hunts Point, a ferry could be most efficient. You might even be able to do something with a ferry from some point along the Harlem River, if there were anywhere for the ferry to dock. But it doesn’t make much sense from midtown or downtown Manhattan, or Brooklyn, or Queens. That would be a good idea if it didn’t involve digging a canal to the LaGuardia terminals. A billion to the airport doesn’t even seem like a particularly bad deal. It’s not like only airport users need to benefit. There can be other stops along the way to or even beyond the airport. It’d benefit anyone working at the airport and commuting there on a daily basis, plus it would reduce congestion in and around the airport too. Stops in the nearby communities would expand transit to underserved parts of Queens, and help spur economic development there as well. Yeah – ppl tend to forget how many ppl work at the airports. In Queens the airports are the largest employment centers actually. Ferries are not a panacea for the city’s transportation problems, and should not be expected to be. We need a diversified transit system with multiple alternatives, as our recent experiences with superstorms and other emergencies have shown. If we have an extensive ferry system in place it can become a vital link in the event of a disastrous situation with the subways not running and the roads congested. Of course, it has to be properly integrated into our transportation system(s) as a whole, and that hasn’t even happened with the MTA alone. I agree. As long as the subsidy doesn’t go too high… ferries can be integral. Especially as housing will continue to be built on the waterfront. I can see a number of places where ferries might be transformative. None of them are in New York City. The closest are way up the Hudson. Was going to say that the ferry issue is a small scale example of what goes on at the national level — focusing on the trivial w/o the courage to implement the needed real solutions. Hallets Cove, Astoria as a Ferry Landing ??? The problem with ferries is how much are you going to charge per fare and where do they go? Hallets Cove is on Vernon Blvd next to a large housing project currently served only by local bus service. The question then becomes if the ferry is too expensive and does not take locals to the desired destinations who is going to come down to Hallets Cove to use the ferry other than a few higher end buildings slowly being built in the area. Until the area gentrifies into a Queens West, LIC it is unlikely ferry service from Hallets Cove is any kind of possibility nor should it be. You did a great job of summing up the political advantages of ferries: There is minimal NIMBY pushback, little up-front capital required, very little construction/lag time from conception to launch, and people have a natural affinity for waterways. They’re also very simple: No need for a large team of engineers and planners to explain how they work, just draw a line in the water from point A to point B. Unfortunately, they tend to be extraordinarily fuel-intensive and slow for long distances, so they’re not terribly useful beyond their given niche. A ferry is an alternative to a bridge or tunnel. It is not an alternative to a subway line or bus line. Should there be ferries staggered along the Hudson River in between the bridges, and especially where there are no pedestrian bridges? Yes. Should there be ferries running up and down the Hudson River? Of course not. Throgs Neck and Clason Point in the Bronx. Two areas unlikely to receive subway service because they are peninsulas. Throgs Neck could perhaps become the terminal station of a Lafayette Ave Line but Clason Point is far too South and wuld still be underserved. I do agree that the subway requires major expansion in the outer boroughs. East 125th Street and Lexington or 2nd Ave. Utilize tracks along Bruckner express or build over to bypass transit served South Bronx. Perhaps one station somewhere in Mott Haven like East 149th Street and Bruckner Blvd. Citi Bike connections at each station.